The Parker Solar Probe mission team at the Johns Hopkins Applied Physics Laboratory, or APL, in Laurel, Maryland scheduled a contact with the spacecraft via the Deep Space Network for four hours around the perihelion and monitored the health of the spacecraft throughout this critical part of the encounter. Parker Solar Probe sent back beacon status “A” throughout its second perihelion, indicating that the spacecraft is operating well and all instruments are collecting science data. Parker Solar Probe began this solar encounter on March 30, and it will conclude on April 10. The solar encounter phase is roughly defined as when the spacecraft is within 0.25 AU — or 23,250,000 miles — of the Sun. One AU, or astronomical unit, is about 93 million miles, the average distance from the Sun to Earth. On March 30, 2019, Parker Solar Probe begins the second solar encounter phase of its mission, culminating in its closest approach to the Sun, called perihelion, on April 4 at 6:40 p.m. EDT. During this solar encounter phase, which lasts until April 10, the spacecraft’s four suites of science instruments are fully operational and storing science data collected from within the Sun’s corona. As designed, Parker Solar Probe will be out of contact with Earth for several days during the solar encounter. This allows the spacecraft to prioritize keeping its heat shield, called the Thermal Protection System, oriented towards the Sun, rather than pointing its transmitter towards Earth. Science data from this second solar encounter phase will downlink to Earth over several weeks later in spring 2019. Parker Solar Probe begins its second solar encounter phase on March 30, 2019. Track the spacecraft’s speed and position online. 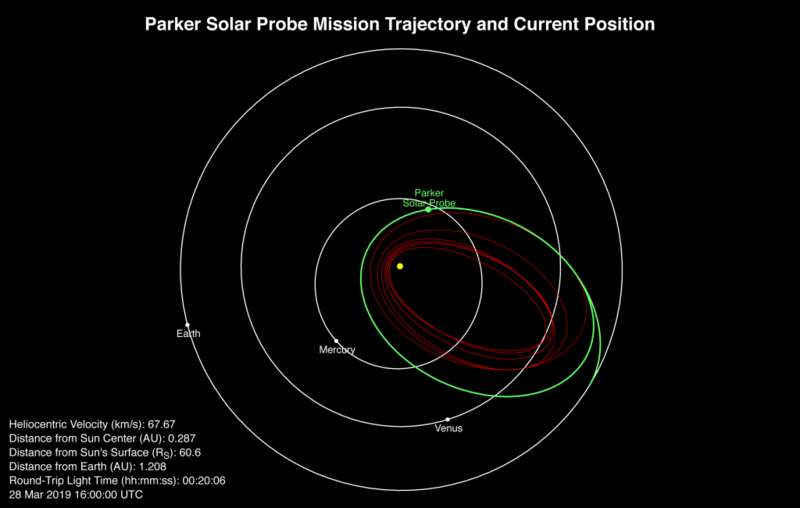 Like the mission’s first orbit, Parker Solar Probe will reach a perihelion of about 15 million miles from the Sun’s surface — meeting its own record for closest-ever approach to the Sun, a little more than half the previous record distance of about 27 million miles set by Helios 2 in 1976. The spacecraft’s top speed of about 213,200 miles per hour is also the same as the first solar encounter of the mission. 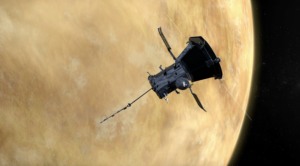 In December 2019, Parker Solar Probe will perform the second of seven Venus gravity assists of its mission, setting up the trajectory that will carry the spacecraft closer to the Sun and to a higher top speed. Editor’s note: This post was updated on April 3, 2019, to include the time of Parker Solar Probe’s perihelion. Parker Solar Probe entered full operational status (known as Phase E) on Jan. 1, with all systems online and operating as designed. The spacecraft has been delivering data from its instruments to Earth via the Deep Space Network, and to date more than 17 gigabits of science data has been downloaded. The full dataset from the first orbit will be downloaded by April. “It’s been an illuminating and fascinating first orbit,” said Parker Solar Probe Project Manager Andy Driesman, of the Johns Hopkins University Applied Physics Laboratory. 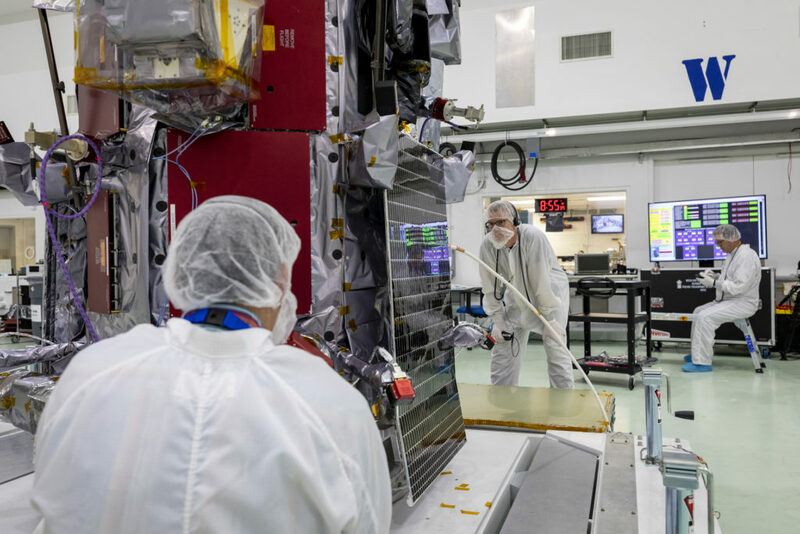 “We’ve learned a lot about how the spacecraft operates and reacts to the solar environment, and I’m proud to say the team’s projections have been very accurate.” APL designed, built, and manages the mission for NASA. 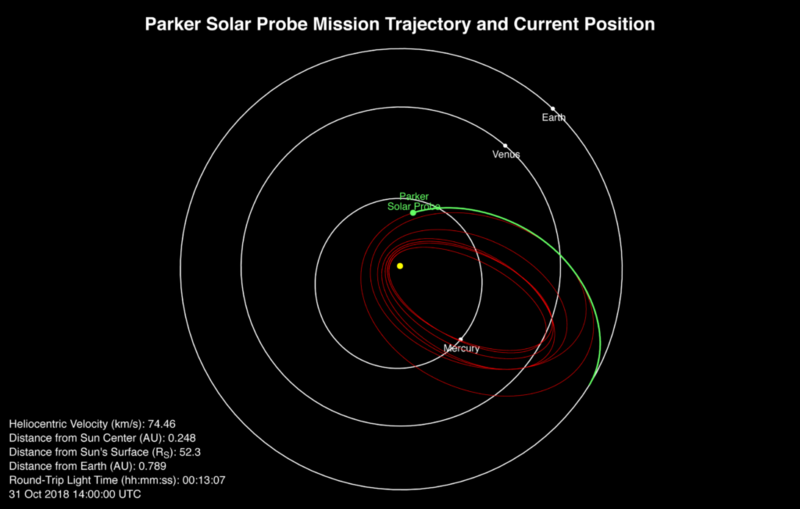 Parker Solar Probe’s position, speed and round-trip light time as of Jan. 28, 2019. Track the spacecraft online. The Parker Solar Probe team is not only focused on analyzing the science data but also preparing for the second solar encounter, which will take place in about two months. In preparation for that next encounter, the spacecraft’s solid state recorder is being emptied of files that have already been delivered to Earth. In addition, the spacecraft is receiving updated positional and navigation information (called ephemeris) and is being loaded with a new automated command sequence, which contains about one month’s worth of instructions. 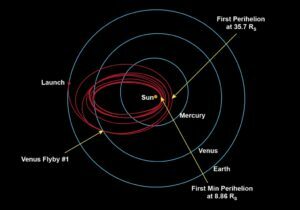 Like the mission’s first perihelion in November 2018, Parker Solar Probe’s second perihelion in April will bring the spacecraft to a distance of about 15 million miles from the Sun – just over half the previous close solar approach record of about 27 million miles set by Helios 2 in 1976. The spacecraft’s four instrument suites will help scientists begin to answer outstanding questions about the Sun’s fundamental physics — including how particles and solar material are accelerated out into space at such high speeds and why the Sun’s atmosphere, the corona, is so much hotter than the surface below. On Oct. 31, 2018, Parker Solar Probe began its first of 24 solar encounters. This period — which lasts until Nov. 11 — is the time during which the spacecraft is within 0.25 astronomical units, or 23.2 million miles, of the Sun’s center. Parker Solar Probe’s four suites of science instruments are on and collecting data throughout this phase, giving scientists their closest-yet look at this dynamic region of the Sun’s outer atmosphere. 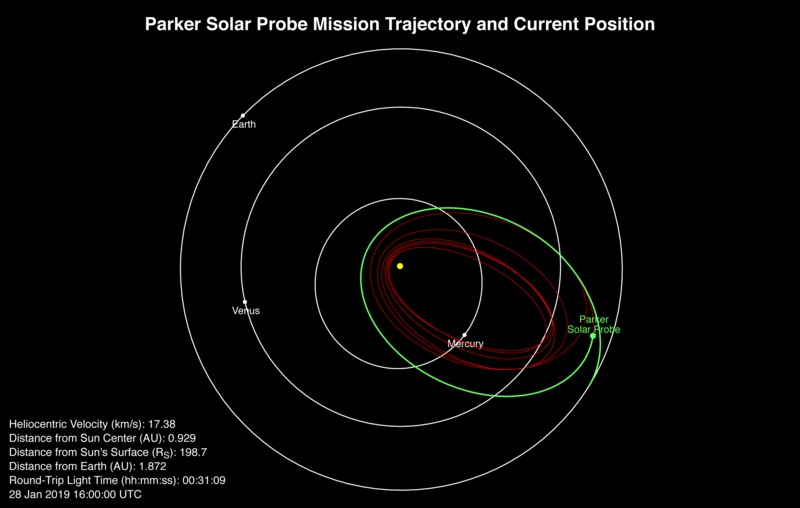 This solar encounter encompasses the first perihelion of the mission, the point at which Parker Solar Probe is closest to the Sun. Perihelion is expected at about 10:28 p.m. EST on Nov. 5. The spacecraft will come within 15 million miles of the Sun’s surface and clock in at a top speed of 213,200 miles per hour relative to the Sun — setting new records for both closest solar approach and top heliocentric speed by a spacecraft. At perihelion, Parker Solar Probe will fly through material at about 3.6 million degrees Fahrenheit — but because material in this region is so tenuous, it doesn’t influence the temperature of the spacecraft. However, the Sun’s intense radiation heats the Sun-facing side of the spacecraft’s heat shield, called the Thermal Protection System, to about 820 F.
Parker Solar Probe’s speed, position and round-trip light time as of Oct. 31. Track Parker Solar Probe’s speed and position online. For several days around the Nov. 5 perihelion, Parker Solar Probe will be completely out of contact with Earth because of interference from the Sun’s overwhelming radio emissions. 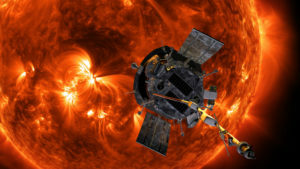 Parker Solar Probe employs a host of autonomous systems to keep the spacecraft safe without guidance from Earth — including automatic retraction of the solar panels to regulate their temperature, attitude control using solar limb sensors that ensures all of the instruments remain in the heat shield’s shadow, and a sophisticated guidance and control system that keeps the spacecraft pointed correctly. This autonomy is key not only during no-contact phases around the 24 planned perihelia but also throughout the mission, when the round-trip light time — the time it takes for radio signals to go back and forth between Earth and Parker Solar Probe — can be up to 31 minutes. During the solar encounter phase, Parker Solar Probe’s four instrument suites measure the properties of material directly within the Sun’s outer atmosphere. These observations, gathered closer to the Sun than ever before, will help scientists begin to answer outstanding questions about the Sun’s fundamental physics — including how particles and solar material are accelerated out into space at such high speeds and why the Sun’s atmosphere, the corona, is so much hotter than the surface below. Because of the spacecraft’s distance from Earth and position relative to the Sun, it will be several weeks after the end of the solar encounter before Parker Solar Probe begins transmitting this science data back to Earth. At about 10:54 p.m. EDT, Parker Solar Probe surpassed 153,454 miles per hour — as calculated by the mission team — making it the fastest-ever human-made object relative to the Sun. This breaks the record set by the German-American Helios 2 mission in April 1976. Parker Solar Probe will repeatedly break its own records, achieving a top speed of about 430,000 miles per hour in 2024. Read more about Parker Solar Probe’s record-making mission. 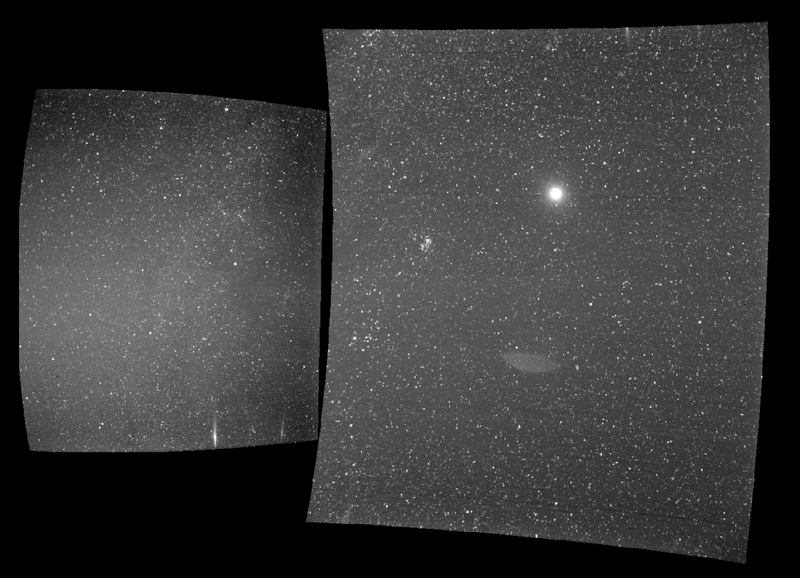 The view from Parker Solar Probe’s WISPR instrument on Sept. 25, 2018, shows Earth, the bright sphere near the middle of the right-hand panel. The elongated mark toward the bottom of the panel is a lens reflection from the WISPR instrument. Two days after Parker Solar Probe flew past Venus toward its rendezvous with the Sun, the spacecraft had drawn close enough to our star that its power-generating solar array wings began to tilt themselves inward – a task directed by the spacecraft itself, based on the rising temperatures – away from the Sun and behind the spacecraft’s heat shield. This is the first time that autonomous, closed-loop solar array angle control based on temperature has taken place on a spacecraft. This solar array movement, controlled by software within the spacecraft’s main processor, began on Oct. 5, soon after Parker Solar Probe’s distance from the Sun dropped below about 65 million miles. Read more from the Johns Hopkins University Applied Physics Lab.